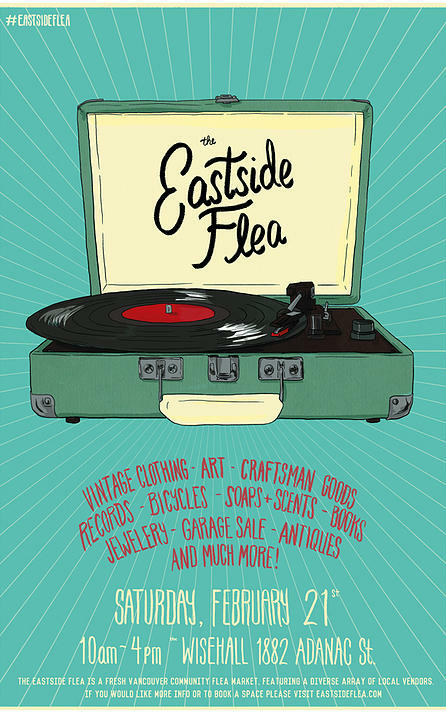 The community-oriented Eastside Flea returns to the Wise Hall, 1882 Adanac Street, this Saturday, February 21st. As usual, they’ve got a great line up of local vendors which will sell everything from mid-century furniture to records to new works by local artists to books to vintage items and so much more. For this weekend’s market, you can expect to local artist, Andrea Hooge, with handdrawn magnets, prints & pins. We are hearing about an amazing handmade soap with pine, cedarwood atlas, eucalyptus, fir, patchouli and black pepper by Product of Science and Art. The Eastside Flea is an all ages event. Admission is $2.00. Eastside Flea runs from 10:00 a.m. – 4:00 p.m.